Despairing that the little girl won’t reappear, Maggie is amazed to find her in her cell, visiting precisely because she was so sad. The girl recalls a time of much crying. Maggie sees her as a beacon of hope, not understanding how she enters and exits. The girl is keenly interested in the music box. The girl says she knows no one to tell about Maggie, but wants Maggie as her friend. Maggie agrees to play catch and sing “London Bridge,” but asks her to be quiet so the bad people won’t hear her. Before the can escape, the girl vanishes. Barnabas hears Maggie singing the song, thinking her happy. Barnabas again extends his proposal to her to live forever as Josette. Maggie vows escape, saying that one knows she’s alive, describing her secret friend in an almost infantile regression. 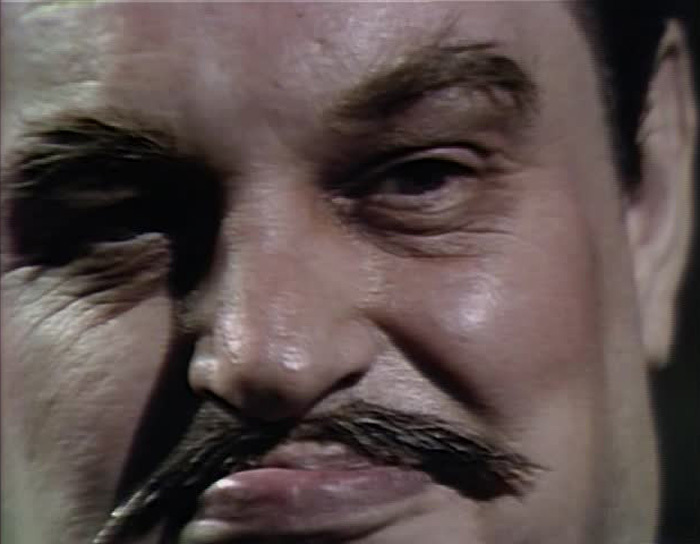 Saddened, Barnabas slips and even calls her ‘Maggie.’ He leaves her, somewhat mournfully. Later, Barnabas tells Willie that Maggie is losing her mind. She’s beyond hope, and must be disposed of. Keeping her there and alive is a risk. Willie pleads for mercy, but Barnabas says that he begged for it once and was refused. He will pay that inhumanity forward, and Willie will suffer the same fate should he interfere in her disposal… tomorrow. Willie visits Maggie and she babbles about her new friend. Wille advises her to keep it straight, as Maggie Evans. No more talk of vanishing children. Willie is desperate for her to regain sanity. He leaves her alone. Only the doll remains in the cell as proof. Just when the story can go no further, the writers open up the entire DARK SHADOWS universe again with the appearance of Sarah. Now, all times are open to them. Was this the point they decided to keep Barnabas around as a character? When I wrote the Collins Chronicles, tying the story together with Barnabas’ inner monologue, the only explanation I had was that he truly believed that Maggie was Josette, and that he was acting as a kind of cult deprogrammer. To see him implode in his failure -- with Maggie’s descent into madness -- added a layer of complexity that no vampire story could touch. Is it too far to call it Shakespearean? Certainly, the irony is of that size. And what cosmic mechanism guides this? Why does Sarah appear now? These are the largest questions in the Collinsverse, and that mystery is one of the elements that both elevates the series and keeps it fractally expanding and contracting with unending complexity. What a key episode. How sad. How joyous. And how ripe with transformation (even with Willie) and complexity. Tony, under Angelique’s control, goes to assassinate Stokes under an assumed name. Over sherry, Stokes leaves for his night cheese (yes, night cheese), and Tony takes the opportunity to poison Stokes’ drink. Stokes, of course, switches the glasses and Tony collapses. The professor phones Julia at Collinwood, reporting that he’s killed a man, like the stone-cold badass he is. Julia revives the victim and explains that he’s Tony Peterson, not “Arthur Hailey.” Stokes knows that it is Angelique’s work. Stokes will fight back by discovering someone she cannot control… a ghost! Reverend Trask is the man. With Ben’s memoir, he has the key to reviving Trask. He also notes that Barnabas’ transformation into a monster is a missing chapter. Via automatic writing, Stokes completes the book in Ben’s hand. But where is Trask? He continues writing, now the location of Trask -- in the north wall of the coffin room. Julie knows the location. Tony comes to, his old self. Stokes explains that Cassandra is behind it all and draws Tony into the fight. The method? Tony is to tell her that Stokes is dead. In Collinwood, Cassandra’s chess lesson with Roger is fruitless. She’s too distracted. Roger complains of her distance and lack of honeymoon. She again demurs. They are alone so seldom, and fight when they are together. Her attention is always elsewhere. She shoos him upstairs to continue his drinking. At midnight, Tony enters the drawing room and reports Stokes’ death, and then leaves when Roger enters. In the basement of the Old House, Stokes prepares a seance. Tony enters and joins the ceremony. Tony becomes possessed by Trask, calling Stokes ‘Ben.’ Stokes tells Trask that ending Angelique will grant him the peace he desires. The candle goes out and a crashing is heard from behind the wall concealing Trask’s remains. I guess Angelique reads a lot of trashy novels. Why else would she have Tony use the pseudonym, “Arthur Hailey”? This is another installment in the classic Stokes cycle, where he struts, conjures, brags, and makes a mess of the dream curse in the name of reason. After so many misguided and ineffectual heroes on the show, it’s as if the writers could take no more. In many ways, he’s like a primetime character come to life. He and Tony Peterson would have made a team I’d have readily watched, and in many ways, this episode allows me to. Stokes: women want him, men want to be him. 1897. Barnabas intends to deliver Dirk to Edward as the vampire he seeks, thus securing his own identity, but Dirk has vanished. He died and rose sooner than Barnabas planned. As they begin the pursuit, Carl minces in fraught with panic. He brings taffy from Atlantic City, and insists that he open the box. It’s empty -- his betrothed has eaten it. It’s Pansy Faye, a garish music hall performer, and needs Barnabas to put her up in the Old House. She wants a church wedding and wants Barnabas to be the best man. Barnabas, eager to hunt Dirk, agrees. She enters, singing “I Wanna Dance with You.” Barnabas truly wonders what the hell has happened. Carl insists that her mentalism will detect Dirk. Barnabas leaves Pansy with Beth, and when they leave, Pansy insists on booze, not coffee. She’s clearly a gold digger. At Collinwood, Judith insists that Dirk be found. Barnabas ditches Carl with Judith. Carl rhapsodizes on Pansy Faye’s mentalism, and reports that she’s on the estate. Barnabas returns to the Old House, empty handed. Judith arrives with Carl and introductions are made. Using Dirk’s cufflink, she insists on her music and the dimming of the lights. She calls for Dirk and faints. Then she murmurs that he is dead and that his murderer is in the room. Pansy comes to with no memory, and Judith storms out when she learns that Carl and Pansy are engaged. Her lack of memory is new to her. They leave, and Pansy goes off in pursuit to give Judith what for. Barnabas and Beth go off to wait for Dirk. A bat attacks Pansy in the woods. Meanwhile, Barnabas and Beth find the grave that is Dirk’s sleeping place. Barnabas returns home to find Pansy bitten and unconscious. Wow. Can any more happen in a single DARK SHADOWS episode? This may easily be the intentionally funniest episode of the show. Barnabas is the one character in the midst of all of the Collinwood chaos who must maintain a very serious cover, so his strained, indulgent politeness to Carl redefines brittle. And Karlen and the writers just lay it on and on and on. From taffy to Pansy Faye 1.0 -- who goes from being a vulgar singer to a psychic -- the distractions from, you know, a vampire on the loose, just keep mounting. Pansy Faye was played by Kay Frye, whose career ranged from Max Reinhardt’s A MIDSUMMER NIGHT’S DREAM (with James Cagney and Victor “The Shadow” Jory) to SHAMUS, with Burt Reynolds. 1970PT. Behind the door, Angelique finds a woman under a sheet. It is the source of her life-force, one who constantly tries to call her life force back to her own body. If her body is destroyed, both might die. At Collinwood, Quentin shows Barnabas the goodbye note from Maggie. Barnabas doesn’t believe its verisimilitude. Quentin asks for Barnabas to cite an enemy of Maggie’s. On cue, “Alexis” enters and protests. Quentin leaves, and Barnabas is a man alone, with Angelique gloating. He demands to know where Maggie is. Barnabas will not rest until Maggie is safe and Barnabas has the proof to destroy Angelique. 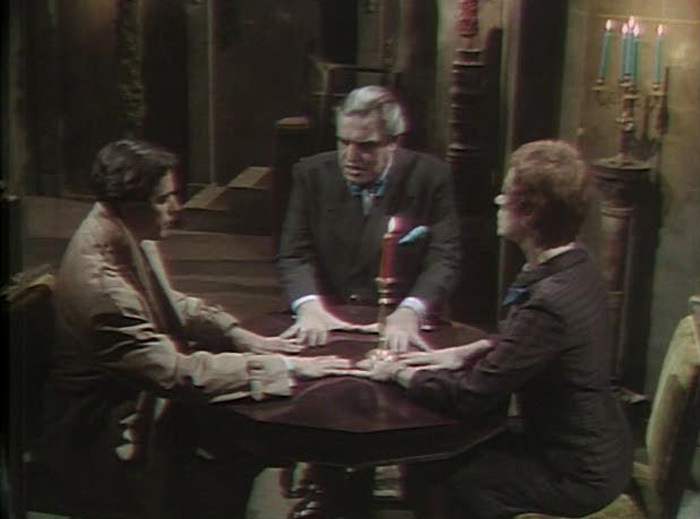 In Main Time, Julia sees Angelique tell Hoffman that Barnabas must be destroyed. Back in Parallel Time, Stokes visits Quentin to see Alexis. It’s his first visit in ages. Alone, Angelique asks Stokes to leave. He’s always been too seedy for Collinwood. He wants to live there when she is mistress of Collinwood. She tables the discussion as Stokes greedily enjoys the drink of Collinwood. She has no interest in his remaining there. In the great hall, Quentin still insists that Maggie left of her own accord. In the stasis room, Stokes conducts a ritual to teach Angelique a lesson. When discussing a trip with Quentin, Angelique feels her strength draining away. She goes to Stokes, demanding an answer. He’s drunk and very much in control. He’s been a loser for most of his life, and now he finally feels himself the victor. In Angelique’s room, Barnabas searches for more clues. He jimmies a locked desk drawer open and finds Angelique’s diary, where she says that “he knows a way to circumvent death.” Barnabas is on the cusp of victory when he finds himself in Main Time yet again. But he has no joy as long as Maggie is in danger. Chris Bernau and Mary Kay Adams. When Barnabas returns to Main Time and his only thought is to save PT Maggie? This is where his heroism reaches Homeric heights. He’s like the Tom Joad of the supernatural… wherever there is a need, he’ll be there. By 1970, when television began giving itself permission to wallow in the grit and grime of “reality,” DARK SHADOWS was the most unlikely place for America to find a hero… a genuine, ruthless hero whose heart was as golden as it was cold. Today is also the birthday of Chris Bernau, aka, Philip Todd. Tall, dark, intense, and genuine, he was very much the “Curtis Type” of leading man. However, he didn’t last long on the show. That could be because of intense stage obligations or because his arguably affected manner of speech gave him an odd kind of Lucille Bluth quality. Either way, his characterization was likable and sympathetic. 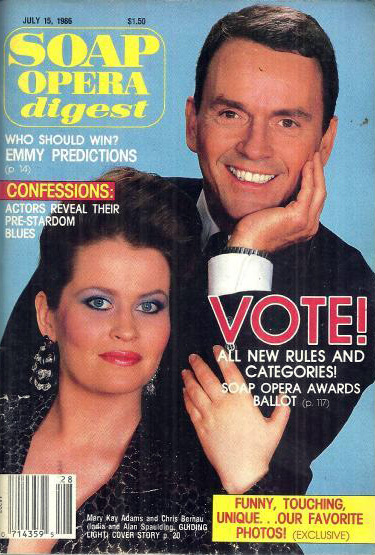 On TV, he found greater success as the first Alan Spaulding on GUIDING LIGHT, which he played for four years until his death in 1989. Quite a man of the theatre, Chris was also seen on Broadway and Off Broadway, memorably in THE REAL INSPECTOR HOUND with Ted Danson and William Bogert. Bogert is a favorite character actor for me. He was the wacky neighbor on SMALL WONDER and Matthew Broderick’s dad in WAR GAMES, where he has the ingenious method for buttering corn.